This is important, as we should give our complete trust to people who we feel can honor our vulnerability. I only have a few friends and a husband who I can say fit all these criteria. And that is true of most people as you look at the acronym and think about who in your life you trust. Do they meet these criteria? 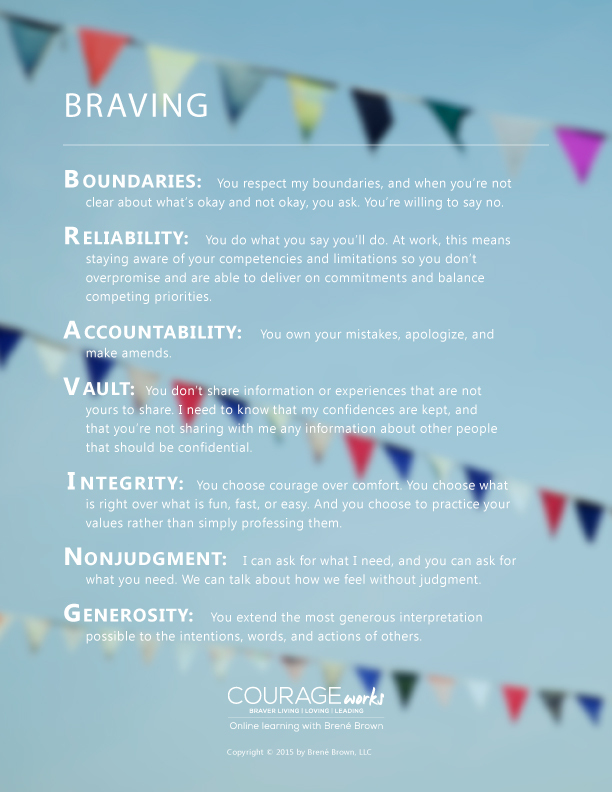 Here is how she breaks it down, using the acronym of BRAVING to define the components of when to trust someone and also to make sure that self trust is present (choose courage over comfort). Four hours later my Mom came into her new room, which also had been arranged with new fall decorations by my friends who found them and put them out. It looked almost identical to her other apartment. And I would NEVER have been able to do it without help. The carpenter who was hanging up a few photos/pictures for her looked at me and said “You have the NICEST friends!” Yep. I do. And I know I’d do the same for them in a heartbeat. Brené says something equally important: If you judge yourself for asking for help, then you can’t give help to others without also judging them. To take Brenés free online course, The Anatomy of Trust, click here. Yep Jay, I’m a work in progress! But this reinforced for me that the positives WAY outweigh the “I shoulda done it myself” — One of my friends was so taken with my mother that she has since visited her by herself. That gift was unexpected and would never have happened if she hadn’t help me. In addition when I gave them all a cookbook as a thank you, they were all quite surprised and touched. I don’t think they had any idea, and maybe they still don’t, on what their help meant to me. To me it was a way of them saying that I was worth a day of their time, that I was worth helping. And I talked about it at a meeting where they were at afterwards. We all need to help each other more, the fallacy that we can do it all is just that, a fallacy!